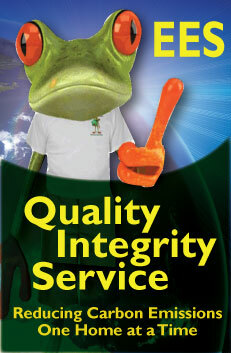 Dinero the Frog learns to Save Energy is a fun and educational video about energy conservation. Poppi the Frog teaches Dinero about energy, where it comes from, how it is used, and what we can do to conserve energy and reduce pollution. Help Dinero Save Energy is a fun short educational video about energy conservation. 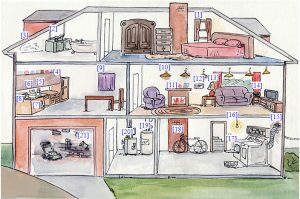 Help Dinero identify what electronic devices you can turn off to conserve energy when you are not using them. CAN YOU HELP DINERO POINT OUT HOW HE CAN CONSERVE ENERGY? Click on the house to open an interactive window. Move your mouse over the picture of Dinero’s home to learn more. Dinero the Frog Learns to Save Energy is a fun and educational book about energy conservation. Poppi the Frog teaches Dinero about energy, where it comes from, how it is used, and what we can do to conserve energy and reduce pollution. Contact us at lcolonees@gmail.com for bulk discount pricing or to setup a presentation at your school. The Save Energy Save Dinero challenge sparks interest in students and engages them through educational live entertainment and take home educational tools. The combination of live character based learning and the take home message provided in book “Dinero The Frog Learns to Save Energy” allows the children to literally bring the message of energy conservation home. Providing simple information on energy conservation to children and families empowers families to make an immediate difference. 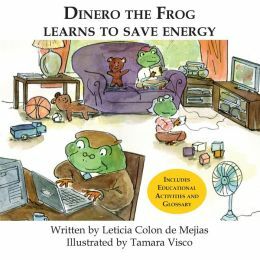 “Dinero The Frog Learns to Save Energy” teaches responsibility through education and action. It brings the power of knowledge to the hands of the next generation creating energy conservation leaders and reinforcing the lessons. 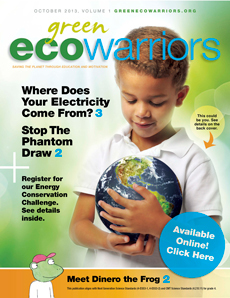 Through our live presentations and publications student’s learn: where electricity comes from, the differences between fossil and renewables fuels, the effects of pollution and global warming, what they can do to defeat the Phantom Draw™, and how to “Save Energy and Save Dinero™”. The book, DVDs, website, and magazines are the first steps in our many educational tools for youth and families. They are designed to serve as constant reference guides to living sustainably.